The ROWANet regional optical telecommunications backbone network (the rowan tree is the symbol of the Vysočina region) is based on a system of optic fibre routes containing passive CWDM technology and CISCO active elements. ROWANet provides network services to public sector organisations (the regional and local government, state authorities, schools, rescue system, hospitals etc.) and non-profit organisations in the Vysočina Region (Czech Republic). This network was built in cooperation with commercial and academic partners usign funds of the European Union (40 %), regional (50 %) and state (10 %) budgets. The basic objective of this project is to significantly develop the telecommunications infrastructure and market in mostly rural region by increasing the backbone and transport services and the competition between providers with direct benefits for the end customer. The secondary object of the project is to provide broadband services to the public and non-profit sector in an attempt to minimise the influence on free economic competition. Apart from the public narrowband Internet, the ROWANet network does not provide direct telecommunications services to the region's citizens or companies. In principle, this network does not compete with commercial service providers. The ROWANet network is administered by employees of the Information Technology Department of the Regional Authority of the Vysočina Region in cooperation with contractual partners. Organisations have a high-speed connection to the Internet (4Mb/s to 1Gb/s) mainly through the CESNET2 academic backbone (see www.cesnet.cz) with a gigabit connection to NIX combined with peering to a commercial ISP. One of the project's priorities is intensive cooperation with the CESNET academic network. The zero aggregation of the user capacities is ensured by the star topology of the dedicated gigabit connections to each node. The Vysočina Region is an indirect provider of Cesnet services in the region. ROWANet network is providing part of its conectivity on IPv6 protocol. Rowanet is a partner of the EDUROAM project (see www.eduroam.cz), the goal of which is European-wide roaming and the mobility of the representatives of the partner organisations, primarily through WiFi access points. As part of this project, the Region is building a network of WiFi hotspots, which provide public narrowband Internet as well as EDUROAM services. Public Internet is provided through WiFi hotspots located in public places (squares, schools, offices...) as limited, i.e. narrowband Internet. Another method of providing publicly- available Internet connections is through "in-door PIAPs" - computers located in public places that provide public Internet services to individuals. Public Internet access points will be established in cities and towns connected to ROWANet. The Vysočina Region provides SAN/NAS disk storage services - the "DDS (Distributed Disk System) project - to organisations connected to the ROWANet and Jihlava MAN networks. These services are provided on the basis of gigabit private networking combined with the reciprocal provision of disk array capacities based on the iSCSI protocol. Tens of terabytes of data can be stored on the regional redundant storage areas for short or long periods through this infrastructure. 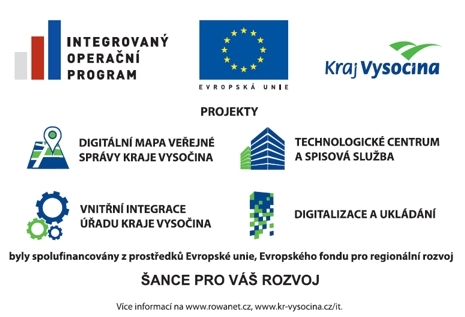 ROWANet provides Geographic Information System map services for the Vysočina Region in a private networking environment. Because of its infrastructure of active elements and free lambda capacities, the ROWANets network can provide virtual private data networking services. ROWANet provides electronic filing room hosting services to offices and plans to introduce a Trusted Electronic Archive service. The Regional Infrastructure provides data services to Integrated Rescue Service units. This primarily involves VPNs, GPS positional data centres, dispatching backup services, DDS and GIS. In 2006 and 2007 the following services will be put into operation in the network: VoIP, an internal certification authority, department network routing (public administration communication infrastructure distribution), an alternative low-cost ISP, eLearning hosting (LMS eDoceo), videoconferences, wireless WiMAX distribution networks (experimentally in the Telč district), equipment and network monitoring (ICMP, SNMP). These, with the exception of the high-speed Internet, are provided to public organisations for free or for a minimal operation fee. The "last mile" of the ROWANet connection is in most cases through the local MAN network mainly owned by the city or town. The object of the project is not to directly set up the local urban infrastructure. The Region resolves the issue of the last mile through partnerships with cities and towns.